Intel Pentium T4500 Processor : This processor has a CPU speed of 2.3 GHz and FSB speed of 800 MHz (Front Side Bus – FSB – is the bus that carries data between the CPU and the one of the two chips in the core logic chip present on a motherboard). It has 64 – bit instruction set, number of cores – 2, number of threads – 2, 45 nm Lithography, 1MB Cache, 35 W max TDP (Thermal Design Power/ Thermal Design Point – TDP – it is the maximum amount of power required by the cooling system to dissipate). The advanced technologies present in the processor are Enhanced Intel SpeedStep Technology (technology which allows the processor to meet its required performance for its operation during minimal power draw and heat dissipation), Intel 64, Thermal Monitoring Technology, and Execute Disable Bit. 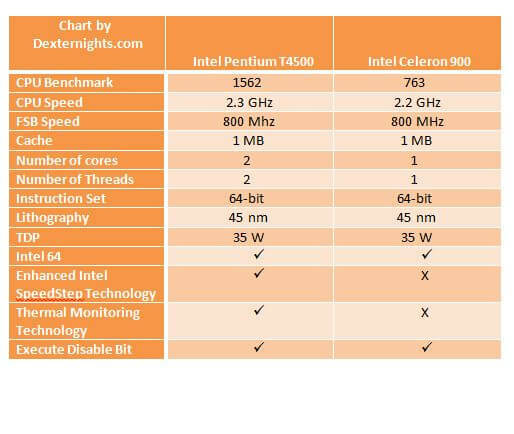 Intel Celeron 900 Processor : The processor has CPU speed of 2.2 GHz and FSB speed of 800 MHz. It has 64 – bit instruction set, number of cores – 1, number of threads – 1, 45 nm Lithography, 1 MB L2 Cache, max TDP of 35 W. The advanced technologies present in the processor are Intel 64 and Execute Disable Bit. While looking at the price and performance Intel Pentium T4500 has better performance and also has new architectural features therefore choosing Intel Pentium T4500 will be a better choice for buying.